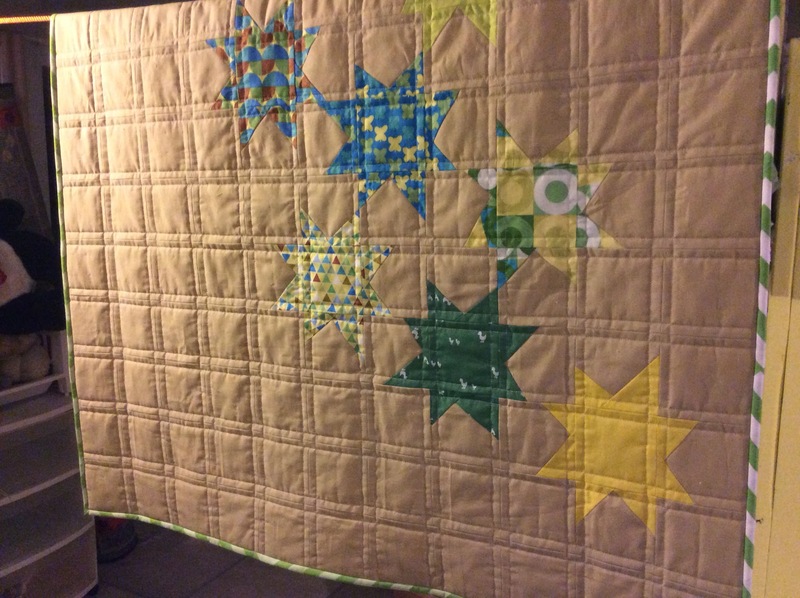 I finished my last baby quilt this week. This one is for a colleague who is expecting his first baby. The weather was terrible here yesterday so I couldn't get a nice outdoor picture. :-(. The colours are so much better in person. The pattern is a free one from the Michael Miller website. 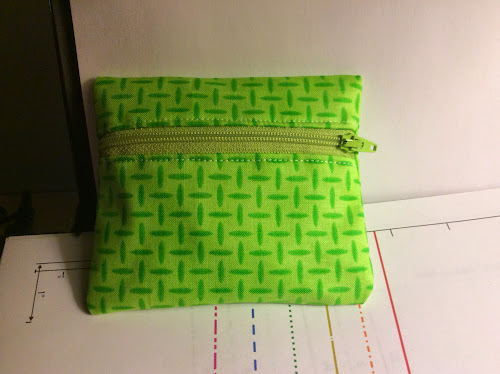 I used a variety of fabrics, including some Kona solids and a Riley Blake chevron print for the binding. For the quilting, although I had some grand ideas about FMQing some stars in the negative space and echoing the bright ones, I ran out of time and had to settle for straight lines with my walking foot. I do like the texture of those lines, each about 1/4" from each seam. The finished size is about 38" x 45". 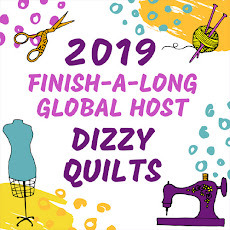 Linking up at Crazy Mom Quilts, TGIFF and My Quilt Infatuation again this week... Why don't you check them out?! I did finish my colleague's baby quilt and will post pictures later this week. Besides that, I only managed to sew up this cute little coin purse. 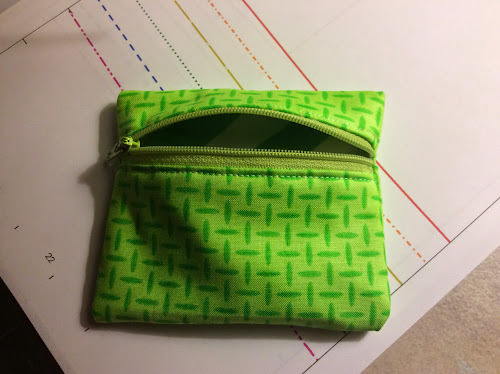 I was reading A Quilter's Table earlier this week and Debbie posted pictures of coin pouches she made. They were so nice, I just had to try one. I grabbed some scraps that were big enough, some batting scraps and a zipper and within about 30 minutes, the coin pouch was done! If you want to give this free tutorial a try, go here. 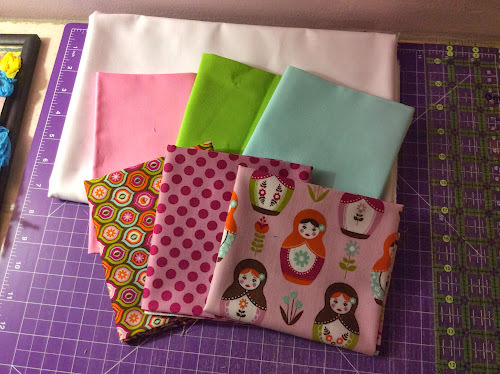 Linking up at Lee's for WIP Wednesday. I finished my Plus quilt this week! Yay! 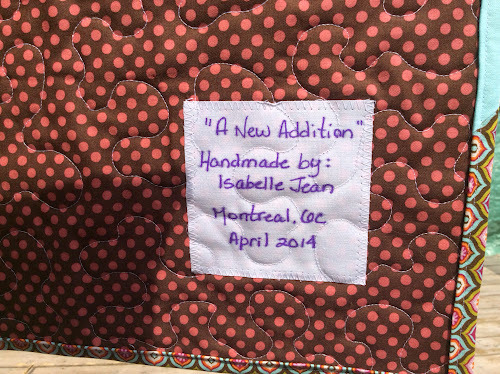 This cute little quilt is going to a friend of my son's who is expecting his first baby next month. I used some Riley Blake prints and Kona solids for this project. I really love the Russian dolls! I quilted it with a soft meander in Aurifil white 50 wt. thread and used scraps from the top for the binding. The back is a print I've had forever. 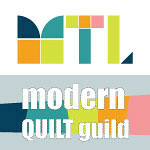 I think I might try to make a few more Plus quilts... Maybe even a full size bed quilt with scraps. Wouldn't that be great? I feels wonderful to finally have a finish to share. Work has been so crazy, I really haven't been able to spend much time in my sewing room. But this week, I am on vacation so have been playing with fabric! Thanks for stopping by and for those of you who celebrate - Happy Easter weekend! WIP Wednesday: A Plus Quilt in the Making! 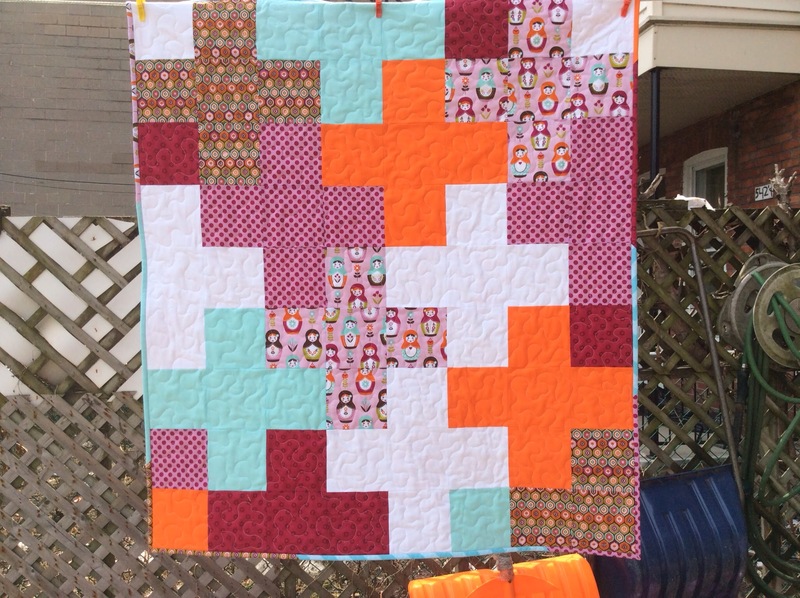 I have been wanting to make a Plus quilt for a long time. 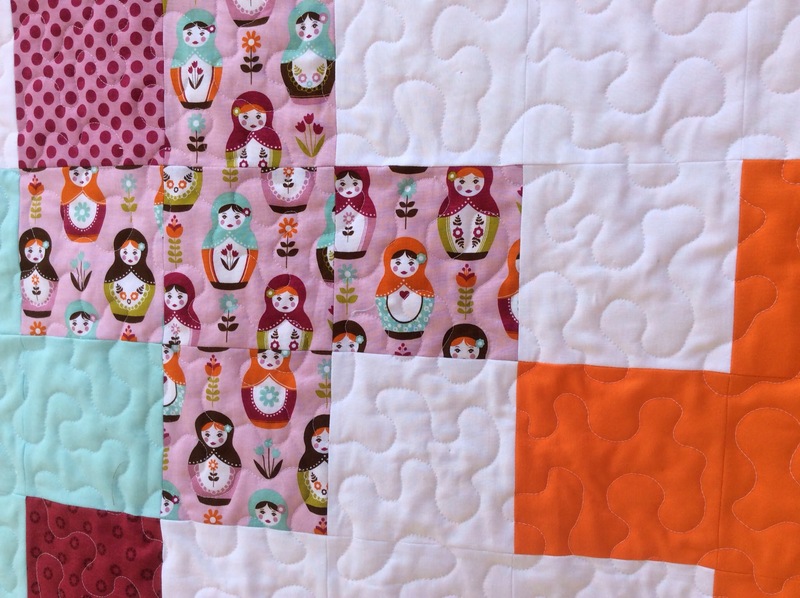 A few months ago, Keera who blogs at Live Love Sew posted a tutorial for an adorable baby Plus quilt and I bookmarked it, swearing to myself that I would make that little quilt one day. 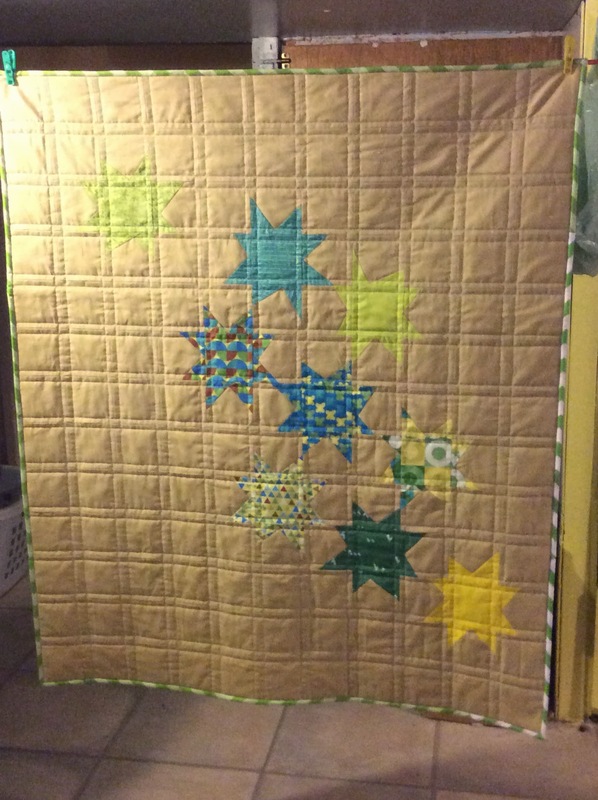 My son's best friend is having a baby in May and Max asked me to make a small baby quilt for the new little girl. 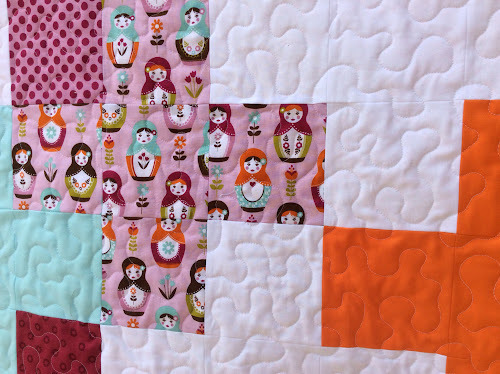 I decided it was time to dig up Keera's quilt design and make this little girl a Plus quilt. 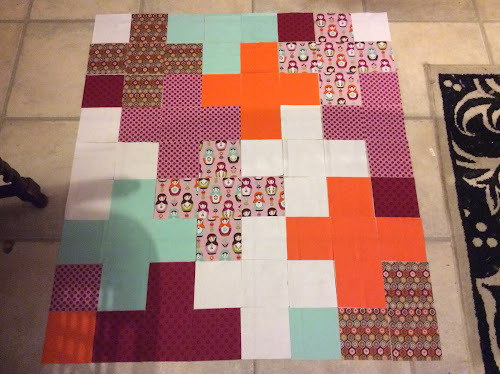 I pressed and cut a bunch of 5" squares and before I knew it, I was down on my "design floor" laying everything out into a really fun plus quilt! 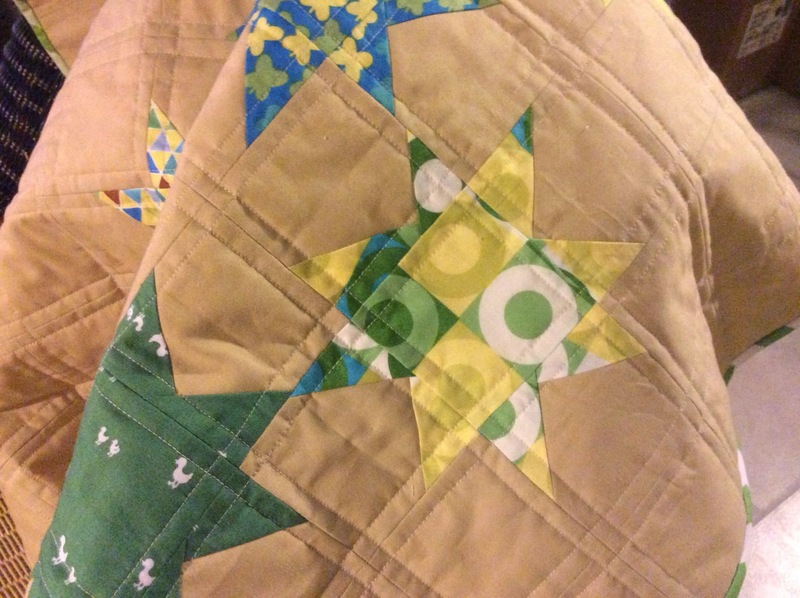 I also finished piecing my wonky stars baby quilt this weekend so hope to have the full reveal for you soon.